We've seen machines from Toshiba's Satellite U500 range before and liked what was on offer. The Satellite U500-12C is the entry-level product and, while it doesn't pack the same punch as some of the more expensive machines, it's still an impressive choice. 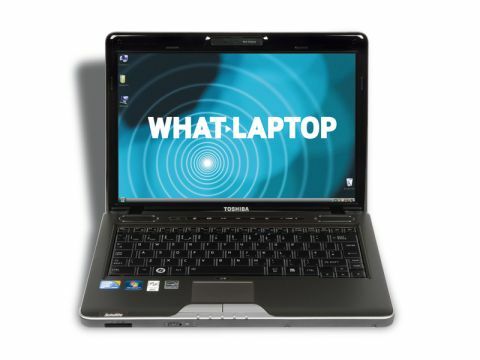 It's quite a compact laptop, featuring a 13.3-inch screen that's ideal for commuting, without being too small. It's a very bright panel, although colour reproduction loses some of its accuracy with brightness settings set to maximum. Turn it down slightly, and colours appear more vivid and lifelike. The narrow screen bezel helps keep the dimensions as small as possible. The screen hinges down over the rear of the chassis for a neat and contemporary look. The design itself is both simple and attractive, with textured plastics set off well by silver highlights. Build quality is excellent, with a robust casing that's tough enough for the daily commute. The palmrests also remain cool, even after long periods of time. The keyboard is a pleasure to use, with large flat keys that are responsive and easy to type on. They're also this machine's only weak point when it comes to quality, however, flexing under pressure. That said, it's a quiet board to type on and shouldn't cause any trouble. Office performance is very good, with applications loading quickly and smoothly. A 64-bit version of Windows 7 Home Premium has been used, allowing all 4096MB of memory to be used effectively. Multimedia performance is more limited. Unlike high-end versions of the U500, this model features an integrated GPU in a bid to keep the price down, so you won't be able to play games or carry out intensive video editing. That said, it's fine for everyday tasks and also helps to offer a reasonable 242-minute battery life. Three USB ports allow you to connect peripherals. One doubles as an eSATA interface, letting you transfer data to external hard drives at high speed, while another is capable of charging your USB devices without turning on the laptop. The 500GB hard drive is generous considering the price, offering excellent storage space. VGA and HDMI ports enable connections to analogue and high-definition displays. Networking features are comprehensive, with 802.11n Wi-Fi, Gigabit Ethernet and Bluetooth. The Satellite U500-12C can't match the 3D performance of some of the other machines but, that aside, it has a lot to offer. If you're seeking a compact laptop for use on the daily commute, then it's one of the best laptops around.